“The U.S. House of Representatives has unanimously passed a bipartisan resolution declaring that systemic violence committed by ISIS against Christians, Yazidis, Kurds and other ethnic and religious minorities in Iraq and Syria constitutes genocide.” Read the rest at the Clarion Project. May we continue to pray that the truth be proclaimed. This entry was posted in Persecution and tagged genocide, ISIS, persecution on March 15, 2016 by frjfkauffmann. Read the rest at the Clarion Project. This entry was posted in Persecution and tagged Daesh, genocide, ISIS, persecution on February 11, 2016 by frjfkauffmann. Father Mattingly wrote the following Reflection. Santiago is Spanish for St. James the Greater, apostle of Jesus and son of Zebedee. By tradition his remains are interred in the crypt of the cathedral at Santiago de Compostela, Spain. There are three images of St. James on the camino and, indeed, in all of Spain: St. James as apostle, as pilgrim and a Matamoros (or killer of the Moors). It is this last image that is more controversial and the image I want to address. 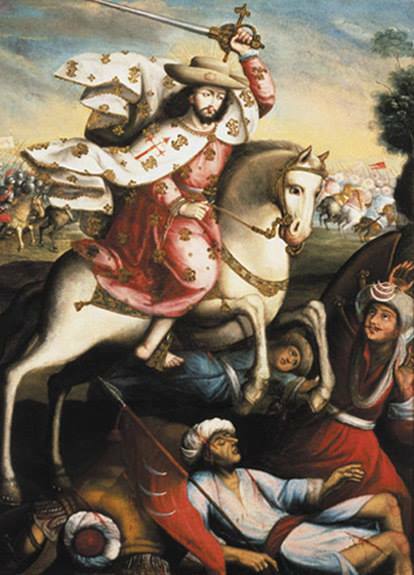 St. James as Matamoros is portrayed in images with Santiago on a horse wielding a sword. Most time on the ground around him, taking the force of the sword, are Moors (adherents to Islam). The image has become distasteful to some people not only because it portrays a saint being violent but because it would seem to project Muslims in a negative light. 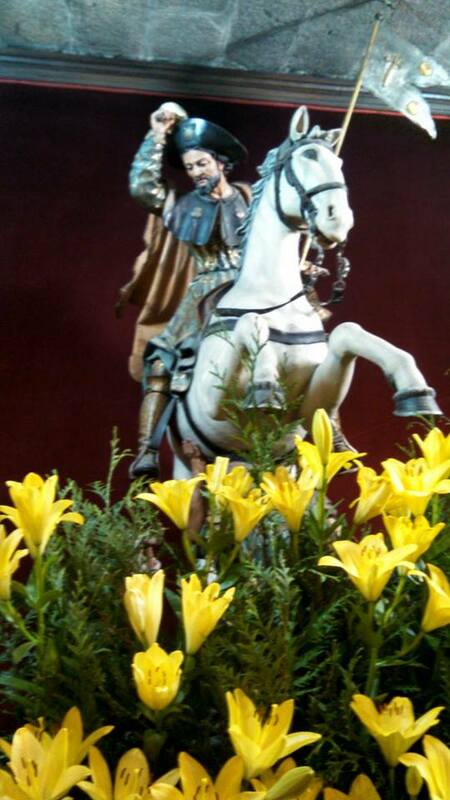 In the cathedral in Santiago flowers have been placed around the statue so that you can see St. James and his horse but not the Moors below him. The objection to this image seems to me to be a misunderstanding of the context. The action portrayed of is not one of aggression but defense. St. James arises under this title at a time when the Moors were conquering Spain. The Moors came as warriors, putting the Christians to the sword and decimating the churches and the Christian culture of the Spaniards. It is said that in a battle when Christian troops were greatly outnumbered, a heavenly warrior on a white horse fought the Moorish soldiers leading the outnumbered Christians to a decisive victory that turned the tide and lead to the reclaiming of Spain. I would suggest that there is value in reclaiming St. James if not as “Matamoros” as Defender of Christians. The recent events around the Islamic State in Iraq and Syria (ISIS), their threats to bring their terror to other countries as well as other extremist groups that arise – often focusing on Christians – suggests to me the need to revive the notion of St. James as our heavenly defender. In no way do I want to see a stance of aggressive violence toward Muslims, yet it may come to a point where Christians will have to defend ourselves from attack, from any source. This image proves that we have a right to defend ourselves from such aggression, indeed a duty. We also have a saint to which we can appeal. Through the intercession of St. James, may Christians be protected from all forms of violence against us. Santiago, defender of Christians… Pray for us. This entry was posted in Camino, History and tagged Camino, History, ISIS, Saint James, Santiago on October 8, 2014 by frjfkauffmann.